In atomic force microscopy (AFM), the dynamics and nonlinearities of its nanopositioning stage are major sources of image distortion, especially when imaging at high scanning speed. 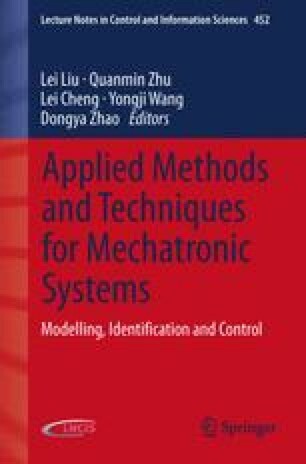 This chapter discusses the design and experimental implementation of an observer-based model predictive control (OMPC) scheme which aims to compensate for the effects of creep, hysteresis, cross-coupling, and vibration in piezoactuators in order to improve the nanopositioning of an AFM. The controller design is based on an identified model of the piezoelectric tube scanner (PTS) for which the control scheme achieves significant compensation of its creep, hysteresis, cross-coupling, and vibration effects and ensures better tracking of the reference signal. A Kalman filter is used to obtain full-state information about the plant. The experimental results illustrate the use of this proposed control scheme. The authors would like to thank Mr. Shane Brandon, SEIT, UNSW, Canberra, Australia for his technical support during the experimental tests.